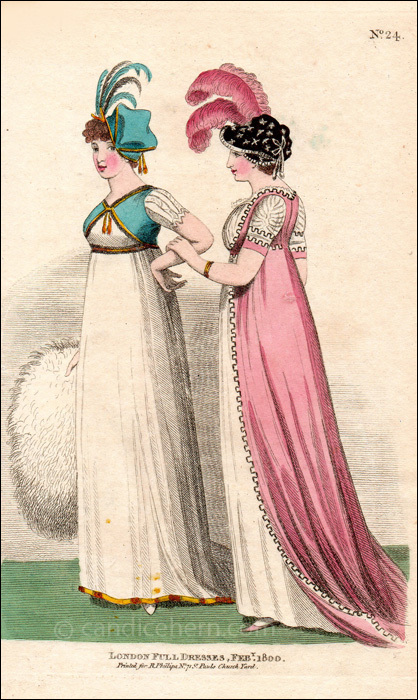 Fashions of London and Paris, February 1800. In this early period, the prints often show hats with evening wear. Evening hats are seen less often as the years go by, but never go away entirely. 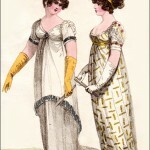 Though the styles of both hats shown here would have been appropriate for day wear, the materials and trimmings mark them as specific to evening wear. 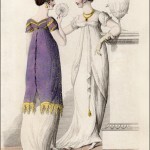 Tall plumes or feathers, whether on a hat or a bandeau, were very typical for evening wear during this early period. You also see more muffs with evening wear in these early years. This muff is not described, but the previous month’s issue showed a similar evening muff and said it was made of silver bear. “Fig. 1. White muslin dress; over the body a corset a la militaire, made of blue velvet, trimmed with brown fur and gold, and fastened in front with gold cord and tassels. The sleeves made of lace and white satin ribband. “Bonnet a la militaire, made of blue velvet, and trimmed with brown fur and gold. Coque feather. “Fig. 2. Robe en Estrusque of pink muslin, trimmed with white satin ribband and brown cord. The body plain and cut very low before with a full front of white satin, which draws up round the bosom, and is trimmed with lace. Sleeves of white satin, full on each side, and drawn up in the middle. The corners of the train fastened back. “Chapeau a la Grecque of brown velvet, spangled with silver stars. Silver cord and tassel. Pink feather.